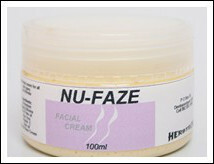 Facial herbal cream for all skin types. Anti-Wrinkle. Ingredients: Germanium, Kigela Africana, Kemaben, Aloe Vera, Carotino Oil, Olive Oil, Evening Primrose and Mineral base cream.